Home > Commercial-Land Mobile-Marine > Uniden > BP-120 : 4.8 volt 800mAh rechargeable Ni-Cd battery pack for Bearcat, Uniden, SportCat scanners etc. 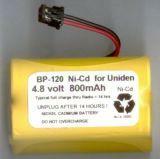 The BP-120 is a 4.8 volt 800mAh rechargeable Ni-Cd battery pack for scanners such as Uniden, Sportcat, Bearcat. Replaces battery #s BP-120, BP-250, BP1000, BP1600. Fits radio models such as BC120, BC220, BC230, BC235, BC245, BC250D, BC296D, BC120LXT, BC235XLT, BC245XLT, SC150, SC180, SC200, Radio Shack PRO90, Scancat, Trunk Tracker, Trunk Tracker 2, Trunk Tracker II, etc. Pack fits inside lower back of scanner. Includes connector. Recharges with original wall charger. These battery packs are assembled by US right here in the U.S.A. Pricing effective 8-15-2018.